A geoshape vector is an object that represents geographic vector features with either point, line, or polygon topology. The features consist of latitude and longitude coordinates and associated attributes. Attributes that vary spatially are termed Vertex properties. These elements of the geoshape vector are coupled such that the length of the latitude and longitude coordinate property values are always equal in length to any additional dynamic Vertex properties. Attributes that only pertain to the overall feature (point, line, polygon) are termed Feature properties. Feature properties are not linked to the autosizing mechanism of the Vertex properties. Both property types can be added to a geoshape vector during construction or by using standard dot (.) notation after construction. s = geoshape() constructs an empty geoshape vector, s, with these default property settings. s is always a column vector. s = geoshape(latitude,longitude) sets the Latitude and Longitude properties of geoshape vector s.
s = geoshape(latitude,longitude,Name,Value) sets the Latitude and Longitude properties, then adds dynamic properties to the geoshape vector using Name,Value argument pairs. You can specify several name-value pair arguments in any order as Name1,Value1,...,NameN,ValueN. s = geoshape(structArray) constructs a geoshape vector from the fields of the structure array, structArray. If structArray contains the field Lat, and does not contain the field Latitude, then the Latitude property values are set equal to the Lat field values. Similar behavior occurs when structArray contains the field Lonand does not contain the field Longitude. If structArray contains both Lat and Latitude fields, then the Latitude property values are set equal to the Latitude field values. Also, a Lat dynamic property is created and its values are set equal to the Lat field values. Similar behavior occurs for Lon and Longitude fields when both are present in structArray. Other structArray fields are assigned to s and become dynamic properties. Field values in structArray that are not numeric values, string scalars, string arrays, character vectors, logical, or cell arrays of numeric values, logical, or character vectors are ignored. s = geoshape(latitude,longitude,structArray) sets the Latitude and Longitude properties, and sets dynamic properties from the field values of structArray. If structArray contains the fields Lat, Latitude, Lon or Longitude, then those field values are ignored since the latitude and longitude input vectors set the Latitude and Longitude property values. The geoshape class is a general class that represents various geographic features. This class permits features to have more than one vertex and can thus represent lines and polygons in addition to multipoints. For more about the property types in geoshape, see Collection Properties, Vertex Properties, and Feature Properties. Dynamic properties are new features and vertices that are added to a geoshape vector. You can attach dynamic properties to a geoshape vector during construction using a Name,Value argument, or after construction using dot (.) notation. This is similar to adding new fields to a structure. For an example of adding dynamic Feature properties, see Construct a Geoshape Vector with Dynamic Properties. Shape of every feature in the geoshape vector, specified as 'line', 'point', or 'polygon'. Geometry is a Collection property so there can be only one value per object instance and its purpose is purely informational. The three allowable values for Geometry do not change class behavior. The class does not validate line or polygon topologies. Latitude coordinates, specified as a numeric row or column vector. Latitude is stored as a row vector. Latitude is a Vertex property. Longitude coordinates, specified as a row or column vector. Longitude is stored as a row vector. Longitude is a Vertex property. Information for every feature, specified as a scalar structure. You can add any data type to the structure. Metadata is a Collection property, so only one instance per object is allowed. If 'Metadata' is provided as a dynamic property name in the constructor, and the corresponding value is a scalar structure, then the Value is copied to the Metadata property. Otherwise, an error is issued. Construct an empty geoshape vector. Set the Latitude and Longitude property values using dot notation. Display the updated geoshape vector. Create a geoshape vector specifying latitude and longitude values as input arguments. Create a geoshape vector using a Name-Value pair to define a new Feature property. This example defines a property called 'Temperature' and assigns it the value 89. To add dynamic properties to a geoshape vector after it has been constructed, use standard dot notation. Add a dynamic property called 'TemperatureUnits' with the value 'Fahrenheit'. To modify properties, use standard dot notation. Update the temperature, and change 'Geometry' to 'point'. This example highlights the two ways by which a geoshape vector with the same features can be created. The first way uses a structure array in the constructor for a geoshape vector. The second way adds fields of the structure array to a geoshape vector after construction. First, read data into a structure array. The array in this example contains 128 elements. Each element defines a river as a line using multiple location vertices. Display the first element in structArray. Note that the Lat and Lon vectors are terminated with a NaN delimiter, which separates the Vertex feature data in the geoshape class. Method 1: Provide the structure as an argument to the constructor that builds the geoshape vector. Create a geoshape vector, providing the structure array as an argument to the constructor. Note that the BoundingBox field in structArray does not get assigned to a property in shape1 because the field value is not a supported type. Method 2: Add features to a geoshape vector after construction. Create an empty geoshape vector. Add the Vertex properties Latitude and Longitude from each entry in the structure array using dot notation. Add a dynamic Feature property, RiverName, the name of the river from each entry in structArray. Since the default value of the Geometry Collection property is 'line' there is no need to set it explicitly in this example. Create latitude and longitude vectors. For illustrative purposes, the vectors do not correspond to the elements of structArray. Construct a geoshape vector using the latitude and longitude vectors and the structure array. Display the first three elements of s. Features are separated with a NaN delimiter. Observe that geoshape uses the arguments lat and lon to populate the Latitude and Longitude properties, even though structArray provides Lat and Lon field values. Also, since lat and lon have fewer elements than features in structArray, the Latitude and Longitude properties expand in size using a value of 0. Create a geoshape vector containing a single feature of the locations of world cities. Append Paderborn Germany to the geoshape vector. The length of each vertex property grows by one when Latitude(end+1) is set. The remaining properties are indexed with end. You can display the last point by constructing a geopoint vector. Create a geoshape vector with two new features containing the cities in the northern and southern hemispheres. Add a Location dynamic Feature property to distinguish the different classifications. Plot the northern cities in red and the southern cities in blue. Construct a geoshape vector and sort its dynamic properties. Modify the geoshape vector to contain only the dynamic properties, Year, Month, Day, Hour, Minute. Read multiple GPS track log data from a file. trk1 and trk2 are geopoint objects. To construct a geoshape vector with multiple features, place the coordinates into cell arrays. Place the elevation and time values into cell arrays. Construct a geoshape vector containing two track log features that include Elevation and Time as dynamic Vertex properties. Each Latitude and Longitude coordinate pair has associated Elevation and Time values. To construct a geoshape vector containing a dynamic Feature property, use an array that is the same length as the coordinate cell array. For example, add a MaximumElevation dynamic Feature property. The Feature property value has only two numeric values, one for each feature. Load coastline data from a MAT-file. 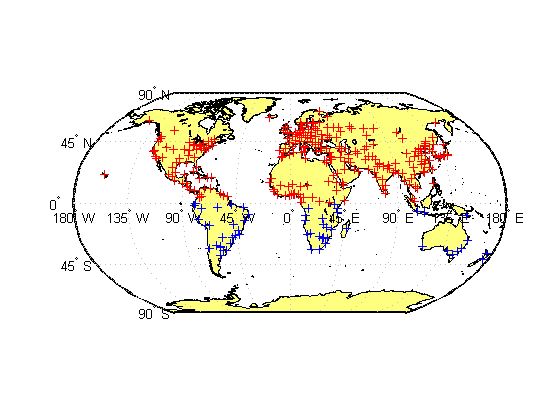 Create an n-by-2 array of coastline latitude and longitude values. Create a geoshape object and store the latitude and longitude data. If you store latitude and longitude coordinate values in an n-by-2 array, geoshape assigns the Latitude property values to the first column and the Longitude property values to the second column. Note that Latitude and Longitude are stored are row vectors in the geoshape vector. Now, create a 2-by-m array of coastline latitude and longitude values. Note the semicolon inside the brackets. Create a geoshape object and store the latitude and longitude data. If you store latitude and longitude coordinate values in a 2-by-m array, geoshape assigns the Latitude property values to the first row and the Longitude property values to the second row. Collection properties contain only one value per class instance. In contrast, the Feature and Vertex property types have attribute values associated with each feature or with each vertex in a set that defines a feature. Geometry and Metadata are the only two Collection properties. Vertex properties provide a scalar number or a character vector for each vertex in a geoshape object. Vertex properties are suitable for attributes that vary spatially from point to point (vertex to vertex) along a line. Examples of such spatially varying attributes could be elevation, speed, temperature, or time. Latitude and Longitude are vertex properties since they contain a scalar number for each vertex in a geoshape vector. Attribute values are associated with each vertex during construction or by using dot notation after construction. This process is similar to adding dynamic fields to a structure. Dynamic Vertex property values of an individual feature match its Latitude and Longitude values in length. Feature properties provide one value (a scalar number, scalar string, or character vector) for each feature in a geoshape vector. They are suitable for properties, such as name, owner, serial number, or age, that describe a given feature (an element of a geoshape vector) as a whole. Like Vertex properties, Feature properties can be added during construction or by using dot notation after construction. If Latitude, Longitude, or a dynamic property is set with more values than features in the geoshape vector, then all other properties expand in size using 0 for numeric values and an empty character vector ('') for cell values. If the Latitude or Longitude property of the geoshape vector is set with fewer values than contained in the object, then all other properties shrink in size. If either Latitude or Longitude are set to [ ], then both coordinate properties are set to [ ] and all dynamic properties are removed.